SPARTAZERO® is a line of premium interior, low odor, Zero VOC paints that provide exceptional hide, durability, and performance. They are ideal for use on residential and commercial projects, schools, hospitals, or hotels and any application where low odor products are preferred. SPARTAZERO® outperforms other brands in durability after repeated scrub cycles. That means the painted surface will maintain its original appearance longer. 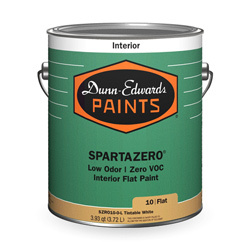 It is always recommended that SPARTAZERO® be used over properly prepared and primed surfaces. Below are our best primers for use on each type of surface.